NASHVILLE, Tenn. (WTVF) — Metro Schools Director Dr. Shawn Joseph is claiming a recent Metro audit vindicates how his administration has handled millions of dollars in contracts. But a detailed analysis of the audit report by NewsChannel 5 Investigates reveals that it leaves many unanswered questions. On Tuesday, the Metro Audit Committee, which oversees the city's internal auditor, voted not to accept the report until members have had more time to resolve questions about the quality of the work. $1 million contract legal - or not? Following a NewsChannel 5 investigation, Metro Nashville Public Schools admitted last week that it broke the law in awarding a $1 million, no-bid contract to Performance Matters for a student-assessment computer platform. The district piggybacked on an out-of state contract that had been put out for bids, which is not allowed under Tennessee law. But the Metro auditor gave the district a pass because state law does not require competitive bidding for "consulting services." It is not clear how a computer product, for which there are competitors, would be considered "consulting." A state law that applies specifically to Davidson County says that contracts for "information management services, including but not limited to, computer program analyst services shall ... be procured through a request for proposals process." Was it a good use of taxpayer money? MNPS admits usage of that $1 million contract may not have been high because "the district did not mandate an assessment administered through the platform." Auditors were silent on this question. Piggybacking - or new, no-bid contract? The audit report says that a $845,000 contract with Performance Matters for professional development software was properly piggybacked on a Shelby County contract. But, as we reported, MNPS negotiated new terms -- which, according to a retired state auditor, violates state law. Metro auditors did not address that issue. MNPS admits its purchasing team piggybacked on other contracts without looking to see if they could get a better price. In the case of the Performance Matters professional development contract, our investigation discovered that other districts got much better prices (per user) by putting the contract out for bids. Again, auditors were silent on this question. Was piggybacking an excuse for a no-bid contract? Dr. Joseph told the school board that the professional development platform was a program that Shelby County "had been using historically... and effectively," insisting that he did not just push a vendor because of his prior relationship with the company. But an email exchange between Joseph and Performance Matters, which began before he officially started as director of schools, shows they were trying to figure out how to "extend our partnership" -- and the "recent Shelby County RFP" offered a way to avoid bidding. In other words, there was no Shelby County history. School board misled in other ways? Dr. Joseph's team also told the school board in June 2018 that the administration had pursued the no-bid contract for the Performance Matters professional development contract because there just wasn't time for a competitive bidding process. In fact, the audit acknowledges there was no urgency, which is confirmed by an email that we discovered. The audit does not address the misleading statements made to the board about that or other issues. Contract changes intentional - or not? The audit confirms the findings of a NewsChannel 5 investigation that the school board approved two contracts with Performance Matters for $1.1 million, but Joseph's team signed contracts for $1.8 million. That's not what Dr. Joseph told the school board back in June. The audit report concludes that allegations of MNPS management having accepted undisclosed consulting fees was "unsubstantiated." 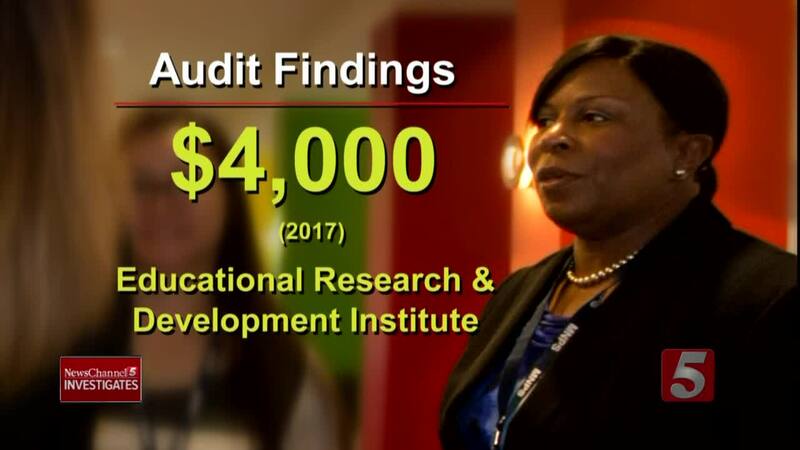 But then it reveals that Chief Academic Officer Monique Felder accepted $4,000 in fees from the Educational Research and Development Institute in 2017 -- that she did not disclose. Felder filed an amended report after auditors started reviewing her consulting fees. The audit suggests the woman in charge of instruction for Metro Schools did not understand the directions to disclose income for the "preceding year." $1 million contract push following Amelia Island trip? Auditors say it was "unsubstantiated" that the administration tried to execute a $1 million contract with Scholastic following a trip to Amelia Island, but then the report describes something really, really close. Was MNPS the only source of income for vendor? That allegation about READ America was "unsubstantiated." Apparently, the vendor said it wasn't true. Was consultant Bruce Taylor qualified? The audit report says the allegations that consultant Bruce Taylor was not qualified or lacked proper credentials was "unsubstantiated." But it does not compare his actual educational credentials to the requirements of his contract. RBT split deals to avoid board approval? The audit says that allegations of MNPS structuring its arrangements with Research for Better Teaching to circumvent the $100,000 board approval requirement is "unsubstantiated." According to the audit, RBT had been paid $172,161. But that entire amount was apparently not considered in reaching its conclusions. "The $147,858 expenditures for the 2017-2018 school year, which were incurred from the General Purpose School Fund only, are the subject of this review," the report says.